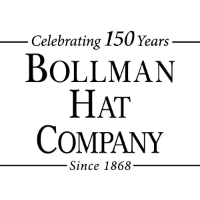 Founded in 1868, The Bollman Hat Company is America's oldest hat maker and we are celebrating our 150th year in 2018. We are a world leading designer, manufacturer and distributor of men's, women's, and children's headwear and accessories. The Bollman Group provides the world with the headwear industry's top brands that include Bailey®, Betmar®, Country Gentleman®, Eddy Bros.®, Helen Kaminski®, Jacaru®, KANGOL®, and PANTROPIC® headwear. We also provide private label products to leading retailers and apparel brands globally. Our hats have covered many Hollywood actors from Humphrey Bogart to Fred Astaire and from Samuel L. Jackson to Nicole Kidman; musicians from Run DMC to Eminem and from Pete Townsend to Ne-Yo; athletes from Michael Jordan to Donovan McNabb and from Chi Chi Rodriguez to Jimmy Rollins. Bollman Hat Company runs Hats.com, BaileyHats.com & Kangol.com eCommerce sites as well as other non-commerce brand sites. We look to the future purposefully and enthusiastically!